Yesterday in al Khalil (Hebron) the Palestinian group Youth Against Settlements held an event to mark the 100th years anniversary of The Balfour Declaration. The Balfour Declaration is viewed as a foundational document of the Israeli states ethnic cleansing of Palestine. Despite promises to the Palestinian population the British government, in an act of betrayal, made a declaration that was viewed by the zionist as a promise of Palestine becoming a homeland for the Jewish people. “The event was colourful and different,“ an ISM’er says. 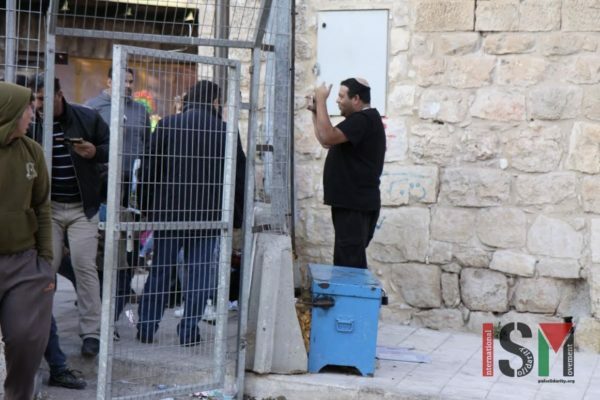 A large group of Palestinians and internationals gathered at the “Beeping Gate” which is one of the closuers in al Khalil (Hebron). The “Beeping Gate” is at the bottom of “apartheid road” where a fence divides a Palestinian pathway from the road Israelis walk on. An extension to the apartheid fence finishes at a new gate which fences in part of the Salaymeh neighbourhood. The gate is locked at night forcing Palestinians to walk a longer route on foot to their houses. 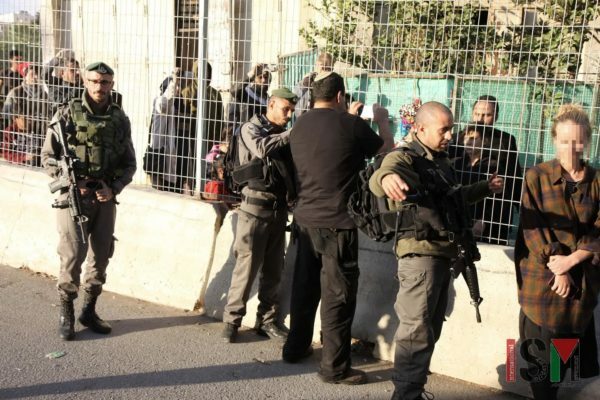 When the people of the neighbourhood use the gate it sets off an ear-piercing beep adding a tormenting repetitive noise to the harsh realities of discrimination and occupation the neighbourhood suffers. Border Police from the Israeli military push Internationals away while a settler from a nearby settlement films. Even tough the event was light-hearted a group of Boarder Police Officers, Civil Police and Soldiers from the Israeli army showed up and watched the Palestinians and internationals. The children chanted, speeches were made and clowns interacted with the children with balloons, dances and face painting. A settler from a nearby illegal settlement films the Palestinians at their event through the gate. An aggressive Zionist settler from a nearby settlement, who had previously intimidated ISM activists during the day showed up at the event. His attempted intimidation failed to disrupt the colourful and joyful celebration of the Palestinian resistance of the occupation. After a while he was led away from the celebration by Israeli Border police. 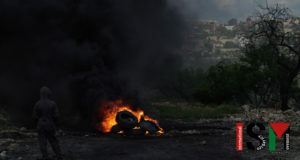 He continued to film from outside attempting to provoke the Palestinians behind the fence. 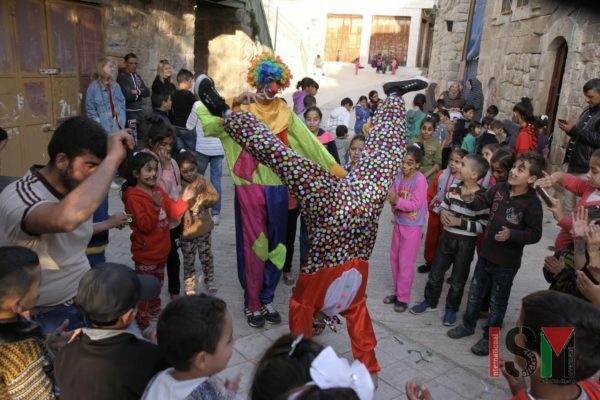 “I think the colourful event expressed the Palestinian’s Sumud (Arabic for stedfastness) against the occupation and discrimination they face on a daily basis,“ another ISM’er said.